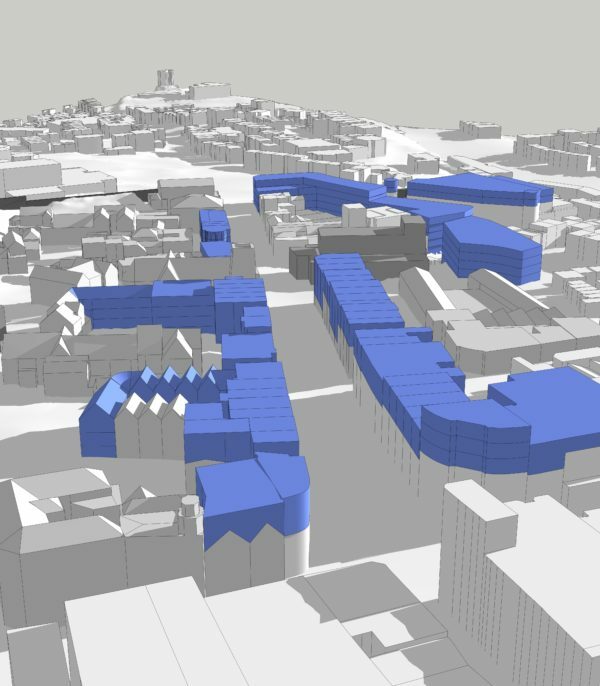 In 2018 LHC was commissioned by Exeter City Council to prepare an Urban Design Strategy for South Street and the surrounding area. We were asked to identify potential opportunities for enhancement and development that would benefit local business, community and visitors to the city centre. Key areas for improvement were identified as creating better access for pedestrians and cyclists, providing better links to the Quay, encouraging more residential and employment use and improving existing building facades. 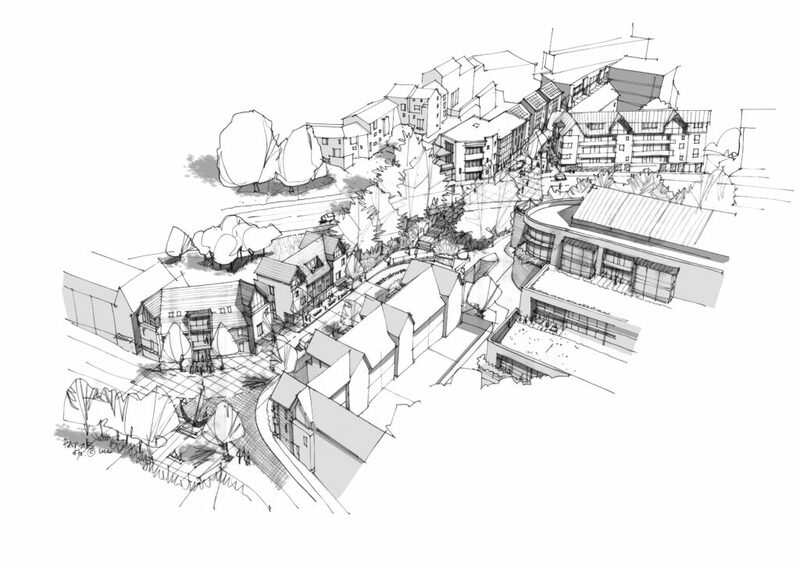 The proposals have been incorporated into the developing City Centre Strategy. South Street lies at the core of Exeter’s historic city centre; roughly at the centre of the walled city and one of the key historic routes in from the south and quayside. The top of South Street is the key crossroads at four key routes through the city centre. Much of the historic fabric of this part of the city centre was destroyed during World War II, and by subsequent post war demolition and clearance resulting in the loss of the tight historic urban grain. The loss of the historic built form and the closure of a number of the historic East-West streets have reduced the permeability of the area and has limited connectivity between the quayside, Cathedral and city centre. South Street has been widened in the post-war period, resulting in a wide street flanked with relatively low-level buildings. It has also become a busy vehicular route crossing the city centre, leading to a car dominated environment with high traffic numbers and on-street parking, which now conflicts with pedestrian movements. Although the street is home to a growing number of independent retail businesses there is a lack of residential and workspace to sustain a vibrant mix of uses commonly found within similar city centre locations. All these issues have resulted in a distinct lack of identity with South Street falling between the existing city ‘Quarters’ with poor pedestrian connections. A stakeholder workshop was carried out before work began to establish a consensus on the key issues, opportunities and constraints on which to base the emerging proposals. All too often urban design proposals in city locations are focused on producing a commercially viable development proposal, often championed by private developers on a site-by-site basis. 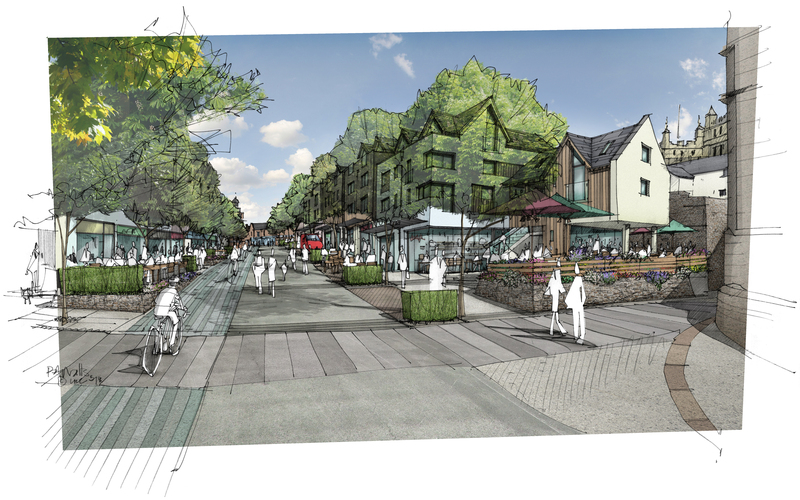 This sort of proposal overlooks the fact that city districts are inter-connected communities, where focusing on the way people use the whole space, socialise and inhabit buildings is fundamental to delivering characterful and liveable places. In the case of South Street, a high proportion of buildings are owned by Exeter City Council. 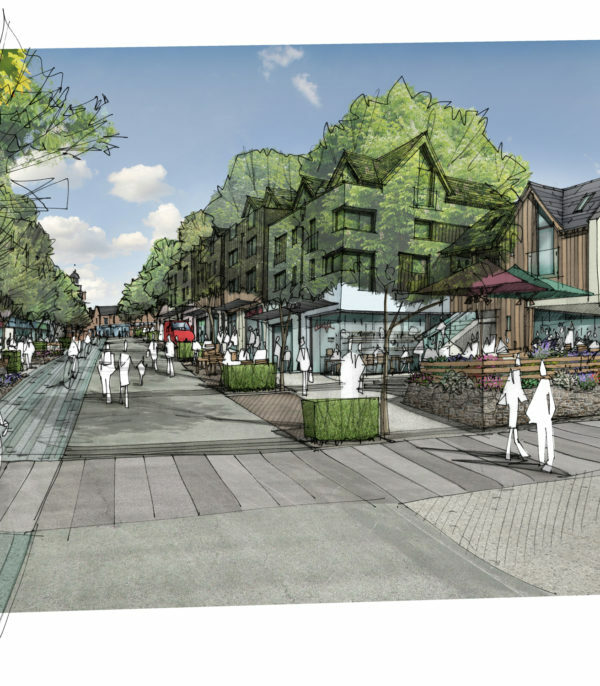 This allowed LHC to pursue a different approach – an alternative urban design process which looks at providing a ‘people and place’ orientated strategy. 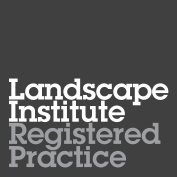 To provide a suitable framework to achieve this, three key sequential and interlinked themes of Life, Spaces and Buildings were used to underpin emerging principles. A series of key ideas were set out under these heading, along with a number of additional early interventions, to initiate momentum. Review the existing vehicular movement to remove traffic from South Street, enabling the repatriation of the existing space as a pedestrian and cycle environment. Intensify and diversify uses to provide continued support for independent businesses. Introduce an increased number of residential dwellings to support surrounding retail, food and beverage and community uses. Maximise street life and community involvement by extending the existing street market, relaxing on-street trading licenses and coordination of community arts projects. Identify of a series of public realm enhancement projects which focus upon enhancing pedestrian and cycle links and maximising activity at street level. The separation of the proposals into smaller costed projects offers decision makers with the ability to decide a flexible and pragmatic approach to delivery. Re-open a number of historic east-west pedestrian routes to maximise permeability between the city centre Quarters. Encourage upward and mixed-use development with new opportunities for flexible work space and city centre residential living above an active street frontage. Introduce a new, high-quality architectural vernacular, which reintroduces a tighter urban grain and vertically proportioned buildings. Although this ‘people and place’ orientated strategy is unlikely to result in an immediate ‘show piece’ of finalised urban regeneration, it is seen as an attractive and pragmatic approach by Exeter City Council, who, like other Local Authorities, are currently struggling to fund council-led regeneration schemes. Click here to view full strategy document.